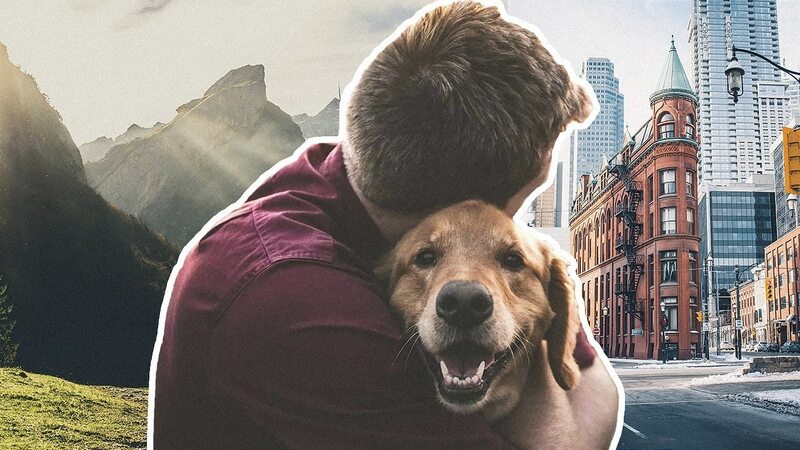 CBD has a lot of benefits for humans, but you can also use CBD can for a variety of different health ailments that your pet might be dealing with it. Coming straight from the cannabis plant, CBD pet tincture will accomplish amazing things like decreasing inflammation in the body, make joints more mobile, treat arthritis and perk up a diminished appetite. Even though the best CBD for pets is produced using the cannabis plant, it does not contain any THC. That means it’s not going to make your pet feel tired or sluggish. Many pet owners like to treat their pet with more holistic methods of care. CBD pet care fits directly into this category. With virtually no side effects to worry about, these products are worth considering. Beneficial cannabinoids are included in CBD, thanks to these fantastic compounds that are part of the hemp plant. While a CBD product might be marketed to one demographic or another, brands can produce CBD oil the same way whether it is for a human or a pet. Since animals have a lot of the same health issues that we have, cannabinoids can be supplemented to rebalance the body and help it function optimally. Just remember, animals shouldn’t be taking the same amount of product that we would consider. If you want to use a human-marketed product for your pet but aren’t sure on the dosing, you can always check with your vet to find out more information that will be helpful to you as a pet owner. You can use CBD for the same pet’s ailments that people have. 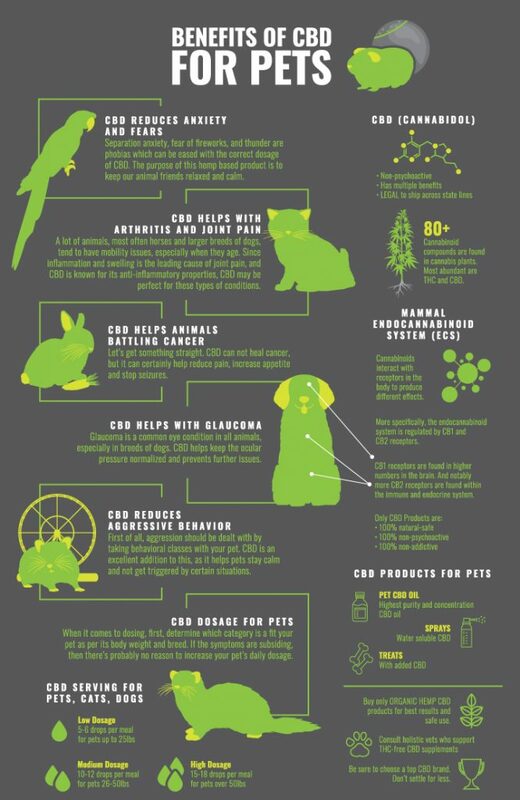 Anything from ongoing pain, inflammation, anxiety, decreased appetite, cancer, side effects of cancer treatment, and better quality of sleep are all potential benefits of CBD when used for a pet. 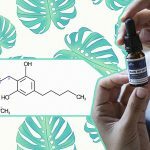 CBD has also shown a lot of promise when it comes to treating seizure disorders. There is even a human-based epilepsy drug that is manufactured using CBD. As a pet age, they may become less active. It’s a normal part of pet aging. In order to keep them feeling their best, you can use CBD to keep them going. Anyone with a pet knows that an animal is a member of the family. Keep them living a long, happy and healthy life with a high-quality CBD supplement that contains everything that they need to function each day. Luckily, there are virtually no harmful side effects that are associated with ongoing use of CBD. You want to start the daily dose out small to see how your pet is going to react. If you don’t notice any change in their behavior throughout a couple of weeks, you can choose to increase the dosage at that point. When given to your pet, you may find that they are a bit thirstier than usual. You can rectify by making sure that your pet has a constant supply of clean water that they can drink. Other side effects are beneficial, including an increase in appetite. It’s useful for pets that may be getting older and experience hunger that is much lower than their usual behavior. 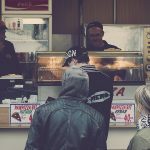 A variety of health issues can also lead to decreased appetite. Before you can determine the dose of CBD that you will use for your pet, you have to obtain an accurate weight for them. The general recommendation right now is 0.05 mg per pound administered twice daily. It means that a 5-pound dog would be taking 0.25 mg, twice each day. Animals can metabolize things faster, so you might find that your pet sees results from their CBD dose pretty quickly. It would also mean that they would usually need more than one dose per day. Pet CBD can support your animals in a few different ways. Make sure that you administer the treatment with an accurately measured dropper. Or you can purchase a pet product that has very controlled dosage information like CBD pet treats. In general, CBD doesn’t make pets sleepy. If you’re using a full-spectrum product, they may become very relaxed. If you notice that this occurs, you may want to work their dose in the right before bedtime. It will promote better sleep, and your pet will be more alert during the day. 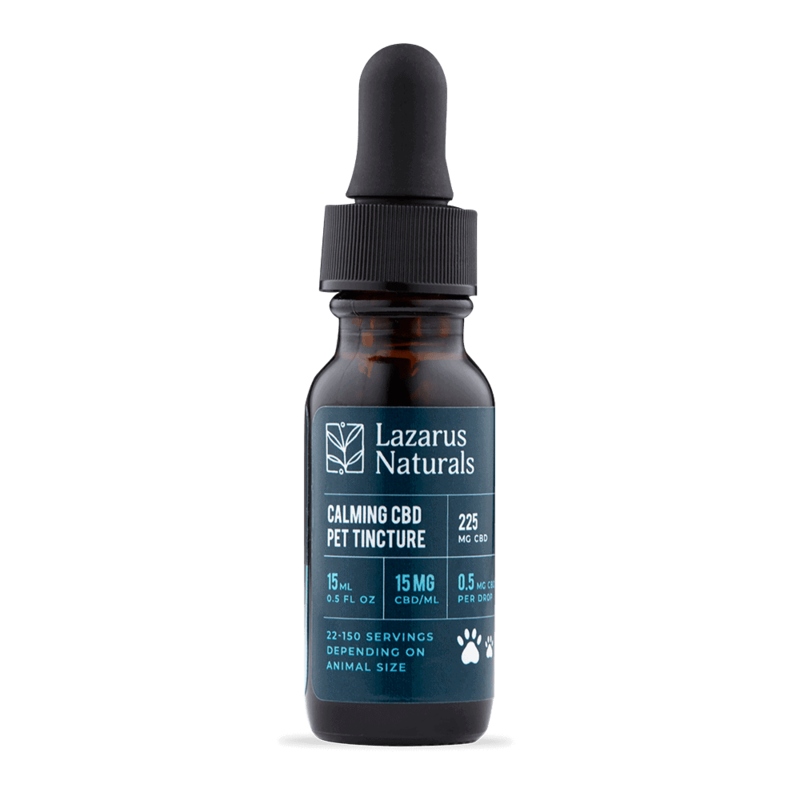 It’s a natural product from Lazarus Naturals that provides 0.5oz of CBD (225mg total) in tincture form. This product works with your pet’s endocannabinoid system to promote healthy joints, decreased pain and calmed nerves. Each dose provides 15 mg of CBD. You can mix it into food or water, and it can be administered orally if your pet will tolerate that. A full-spectrum CBD oil will provide your pet with beneficial CBD, but it will also provide many other cannabinoids to your pet. This NuLeaf Naturals product provides 5 ml of CBD oil (240 mg total) that is safe for daily use. It has a very mild taste. Your pet may even let you administer it straight out of the dropper. It can also be mixed in with their food or water. This product from Bluebird Botanicals is made from a full spectrum hemp oil, containing a variety of beneficial cannabinoids. 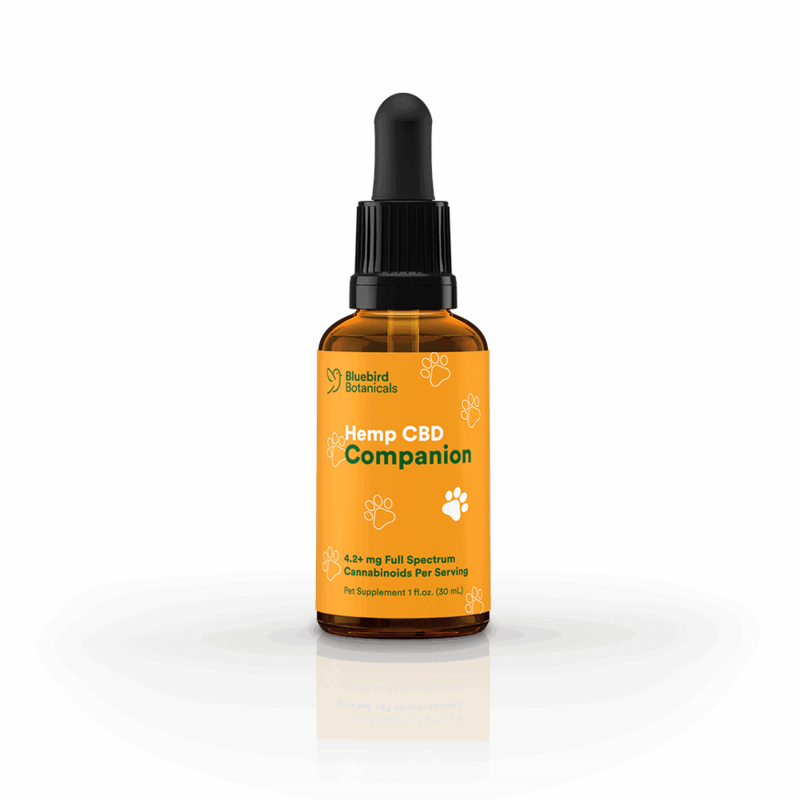 This 1 oz bottle (250 mg total) is the perfect investment if you want to try CBD out for your pet for the first time. Great for reducing pain and inflammation, this supplement promotes overall excellent health. You can mix it with food or water, and it can be given to your pet orally if they will tolerate it. How to Choose and Use CBD Oil for Pets? Speak with your pet’s veterinarian for more information on CBD administration. Obtain an accurate weight for your pet to determine the dosage needed. Shop for a high-quality pet CBD product that is safe to use with animals. You can obtain third-party lab results to ensure there are no harmful ingredients in a specific product. You can also confirm there is no THC present. Administer the recommended dose of product to your pet. Watch your pet for any changes in behavior. The changes you see might be beneficial. If you notice your pet becoming lazy, tired or confused, stop using the CBD product and contact your vet. If you need to increase the dose of CBD for pets that your pet is using, only make slight changes every couple of weeks. Your pet’s body needs time to adjust to the increase. If you have been using a CBD oil for pets for several weeks, consider using a full-spectrum product to provide even more benefits. CBD for pets can be used for your pet daily. There are several different products that you can use for this process. Some tincture products for humans can be used for pets as well (check with the manufacturer). You can also choose to invest in a pet-based product that comes in an oil form that can mix with food or water. There are also pet treats that you can give to an animal. There is a very metered dose of pet relief CBD in each serving size.